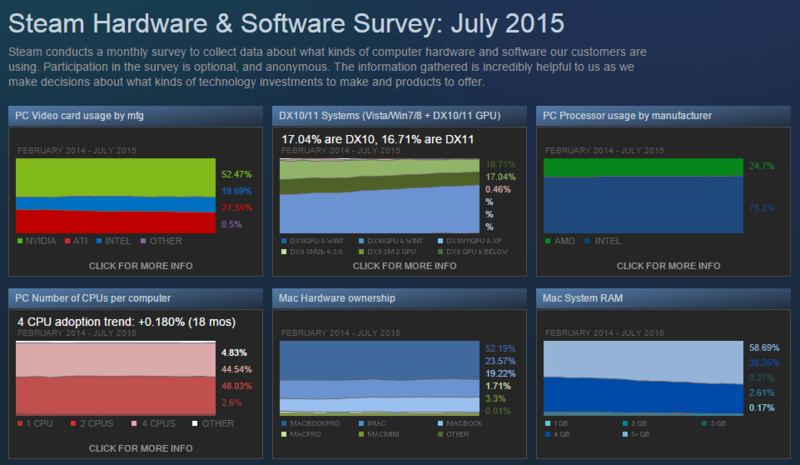 Steam conduct in-depth surveys every month to find out which hardware and software gamers are using. Last month’s survey report reveals that most gamers are still in dual core and 720p. According to Steam July 2015’s hardware survey, their only 34% of gamers in Steam using 1920×1080 resolution and 26% running 720p, but it’s mainly because there lots of gamer’s using laptop with standard resolution of 1366×768. The other resolution like 2K 1440p has 1% and 4K is lesser then 1%, which shows us the progress of resolutions. Second this is CPU’s 48% of Steam users still at dual-core CPU’s and quad-core CPU’s at 45% with average clock speeds are between 2.3 GHz and 2.6Ghz but Intel CPU’s with 75.3% dominate AMD CPU’s just 24.7% users. When comes to GPU NVIDIA cards dominate every one with 52.47% and AMD at 27.34%, but Intel onboard GPU also have a significant users 19.69% and DirectX DX12 is 0.48%, DX11 on 16.71% and lastly DX10-9 has 17.04% users.